Durlston's Guillemot colonies are both the most easterly and second largest on the South Coast. 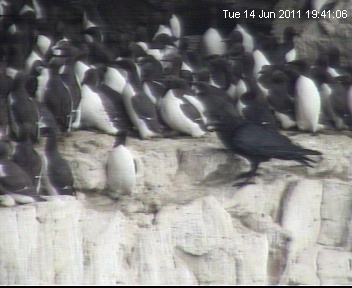 They were up until 2012 some of the most productive, with an average of 0.8 chicks per breeding site. Tufty our most famous bird has not returned for the last 3 years and must be assumed dead. He bred here for at least 16 years, maybe more. (He was identified by the white "mohican" hence the name!). The surveys at Durlston are all done via our live cliff-camera link, which runs 400m from the cliff edge to the Visitor Centre where a remote control unit allows operation of the camera. To find out more about Guillemots, join a guided walk or a seabird boat trip (May-July). It was a very very poor breeding season at Durlston due entirely to the predation of the upper ledge by a family of Ravens. On one morning 9 eggs were taken in a 30 minute period. 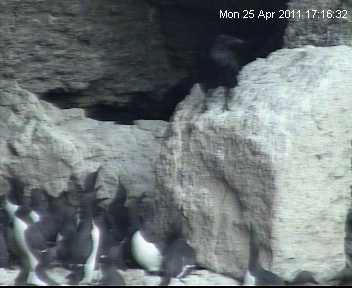 The ledge was emptied of eggs, chicks and adult Guillemots by the activity of the Ravens. 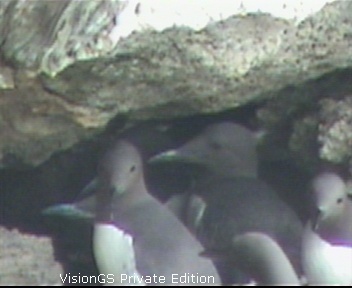 Only 3 chicks fledged from the upper ledge were the recent numbers have been 80+ chicks. Another successful breeding season, with well over 65 identified sites - where pairs of Guillemots are present throughout the breeding season. The first egg was laid on 15th April (but subsequently lost), the first chick hatched 20th May and the first fledge noticed was 13th June. All the birds had left the ledges by early July. During the main seaon the number of birds counted on the upper ledge averaged at 260, with the maximum count on 17th Feb of 333 birds. A few unusual incidents were noted, including predation by corvids, with Crow and Raven both seen trying to steal eggs from the ledge. Another successful breeding season, with well over 50 chicks fledged. The first were laid on 24th April and the first chicks hatched 24th May. All the birds had left by early July. 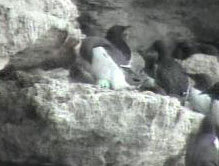 The cliff camera was returned to the cliffs on 19th February. 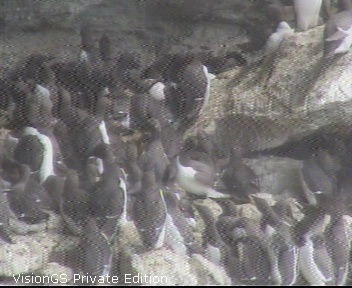 324 Guillemots were counted on the upper ledge on 28th Feb - the maximum so far for the year. Sad News : Tufty has not returned this year, after being here for at least 16 successive years. Good News : The first eggs were laid on 22nd April, the first chick hatched 23rd May, and 64 chicks were identified as part of the breeding survey. All the chicks have now left the ledges. 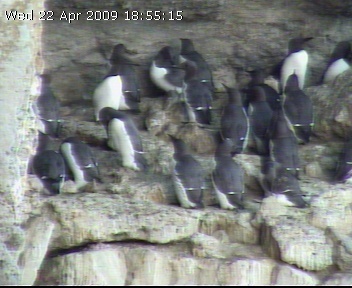 The adult Guillemots will return to Durlston occasionally from October onwards. A count on the 10th April saw 343 on the upper ledge and a further 89 on the lower ledge. These numbers include "Tufty", 1 bridled and 1 'speckled' bird - the head plumage has not fully changed from the winter white to the breeding brown. Tufty again returned to his territory and successfully hatched and fledged a chick. The first chick was due 26th May. We ran breeding and feeding studies this year, including 'dawn to dusk' watches on both 5th & 9th June. 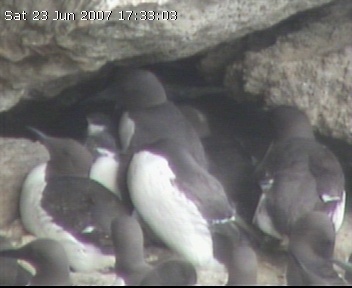 The Guillemots had another successful breeding season with over 50 chicks recorded, the majority of which fledged the ledge successfully. However 3 were seen to be taken by predatory Great Black-backed Gulls. 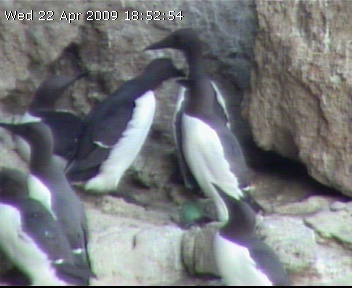 The last Guillemots left 8th July 2007. Chicks and Tufty - white splodge on back of head in background of picture! Is a common coastal resident, winter visitor and offshore passage migrant. The annual seabird counts recorded 602 Guillemots at Durlston. The records which follow were observations from the cliff camera. The first record of the year was on 3rd January, when 220 birds were counted on the upper ledge (including ‘Tufty’, one bridled bird and a few in winter plumage). The average of subsequent counts was 194 birds on the upper ledge and 32 on the lower, making a total of 226. This is lower than in 2005 but the frequency of counts was greatly reduced in 2006. The maximum count was on 27th February with 240 birds on the upper ledge and 73 on the lower. Birds visited regularly between January and March, with permanent occupation from 16th April. 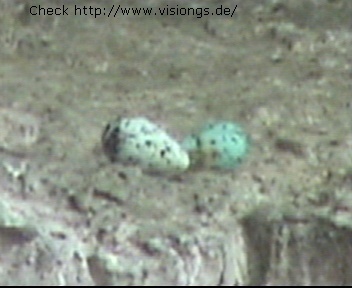 The first egg was laid on 24th April and the first chick was seen on 29th May (two eggs were abandoned and three chicks at least failed to fledge at the end of season). 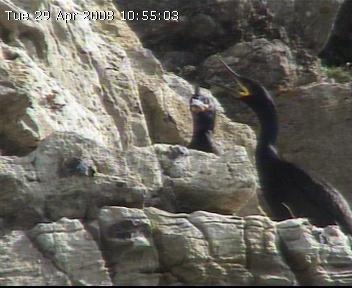 Unusually, a very late chick was present on the lower ledge until 19th July. No birds were seen in the area from then until 20th November. From 20th November, they were recorded on or around the ledges for 21 days. Virtually all of these birds were in breeding plumage by this time. Unfortunately, the camera lost its wiper this year and the study had to be abandoned from the start of June because of lack of visibility. 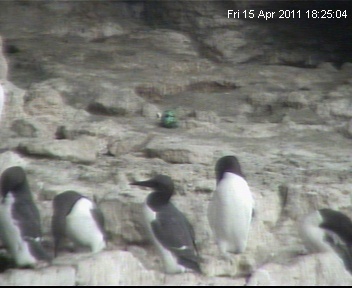 The years Guillemot study was undertaken at Durlston Country Park through the remote camera positioned on the cliff. Records of presence or absence in the early morning were taken throughout the year from the cliff looking back at the upper ledge. The lower ledge is not visible from the cliff and on many occasions birds were present on the water and flying in the area, when not recorded on the ledge. Overall a fairly successful year despite the weather, with an increase in the overall number of birds, whilst the number of breeding pairs remained relatively static. 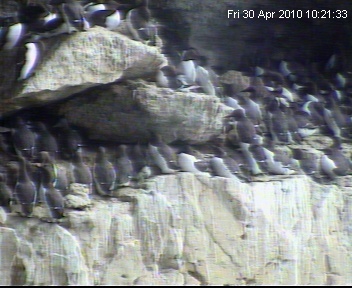 This year the Guillemots returned in large numbers, over 300 counted on 16/04 – this is the highest number ever. The counts remained high during the season. The increase in numbers was particularly evident on the east end of the ledge – frame 5 and in frame 4. 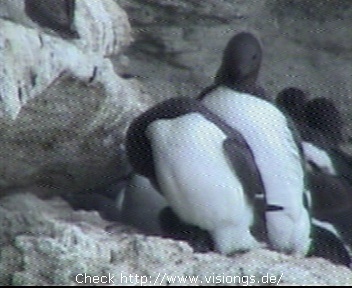 (see video evidence) There were a number of additional sites, some of which produced chicks. 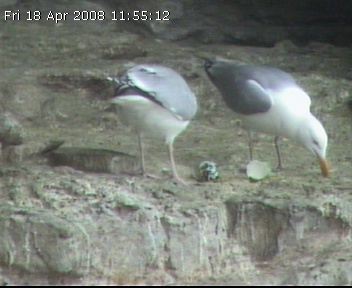 Another area of increase was on the peripheral rocks – including the angled rock and the area previously occupied by Herring gulls – this may be a factor as to why the Herring Gulls did not breed in their usual spot on the ledge. 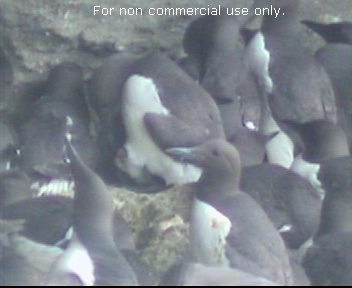 The number of eggs abandoned = 4 : (3 on 18/05 – 2 of which were later resat upon) plus another in frame 1 on 07/07. Chicks lost : 2 of later chicks definitely lost earlier than fledging would have expected. 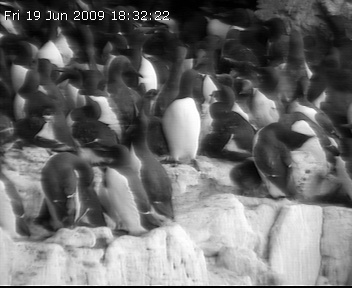 There were some extreme weather conditions this season with storms, strong winds and heavy rain – with reactions of the Guillemots particularly noticeable – the numbers of adults fell dramatically after the storms of 23/06 (low pressure 993, max gust 60mph) & 26 – 28 /06 (more strong winds and 11.5mm rain). Rain & gales 04-06/07 – pressure low – 972 min), more strong winds 08/07 and thunder 10/7. 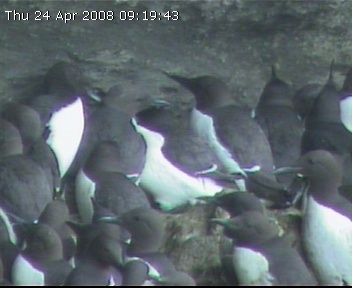 The number of chicks appeared affected on the first occasion, with the adults being more static on the ledge than usual – normally the numbers would be expected to fall more gradually over a longer period. This year the numbers held up for longer – with 116 counted on 04/07. 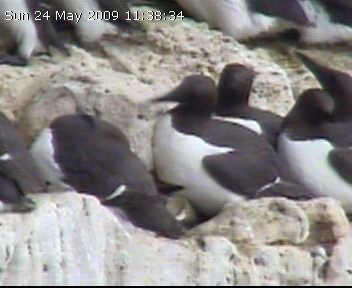 Tufty and the bridled : Tufty moved slightly further into the recess under his rock and hence became very difficult to monitor – no records of egg or chick were made, but I can’t be sure they did not have one, and Tufty was last seen 27/06. Bridled birds : almost certain that a total of 5 seen at different points around the upper ledge – top rock x 2, 1 in frame 4, 5 and 1. 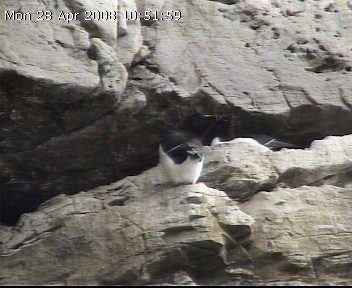 The bridled on top rock had a chick, as did that on number 4. 18/05/04 2 abandoned eggs – frame 4: abandoned egg at 3 – whether 3 or other ? This Guillemot colony is the most easterly on the south coast of Britain and at the edge of the birds geographical range. 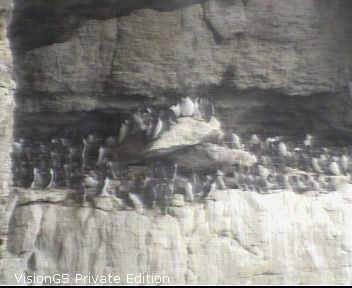 In 1993 a camera was set up on the cliffs to monitor this colony. 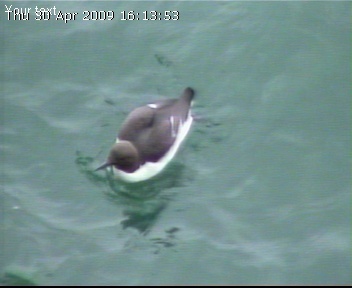 2003 was to have been a year of detailed study with Breeding and Feeding surveys being undertaken during April, May and June. This would have allowed a comparison with the start of the study, and analysis of 10 years of results (the camera failed in one year).